Kate Golembiewski | Field Museum Jan 31, 2019. The fossil skeleton is incomplete, but paleontologists still have a good feel for the animal, named Antarctanax shackletoni (the former means “Antarctic king,” the latter is a nod to polar explorer Ernest Shackleton). Based on its similarities to other fossil animals, Peecook and his coauthors (Roger Smith of the University of Witwatersrand and the Iziko South African Museum and Christian Sidor of the Burke Museum and University of Washington) surmise that Antarctanax was a carnivore that hunted bugs, early mammal relatives, and amphibians. 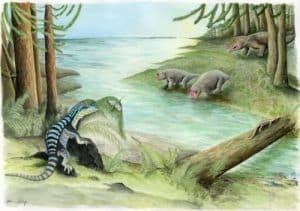 The fact that scientists have found Antarctanax helps bolster the idea that Antarctica was a place of rapid evolution and diversification after the mass extinction. “The more different kinds of animals we find, the more we learn about the pattern of archosaurs taking over after the mass extinction,” notes Peecook.